An apron sink is a stylish basin that protrudes past the kitchen or bathroom countertop and cabinets. Also known as a farmhouse sink, this type of sink is mounted under the counter, with the front edge of the porcelain or other material visible, rather than hidden behind a cabinet or false drawer. The apron sink has earned its cachet in some ways, but it also has several drawbacks. Here are some advantages and disadvantages of the apron sink for bathrooms and kitchens. Aesthetics: The obvious draw of an apron sink for most people is the unique look. The design makes your sink an artistic statement. Versatility: Dozens of manufacturers are jumping on the apron sink bandwagon, so homeowners will find a wide variety of materials. The majority of apron sinks are made of enameled porcelain (also marketed as “fireclay”), but stainless steel, copper, cast iron, and other materials are available. Convenience: The front edge of a farmhouse sink is sometimes narrower than other, more standard styles. This tends to make them more accessible. The front edge is also easier to clean, as there is no gap between the countertop and the sink. Cost: Apron sinks are typically much more costly than other undermount or top-mount sinks. Moreover, installation is also typically more expensive and complicated for apron sinks. Top-mount sinks are a fairly easy DIY installation. Undermount sinks tend to be a little more complicated, but they are mainly suspended from the counter. Apron sinks, on the other hand, require a support platform from either the sides or the bottom of the cabinetry. You may also need to hire a pro to build custom cabinets. Aesthetics: While many homeowners love the farmhouse sink look, just as many people complain about the unusual look. While it’s always difficult to quantify the change in resale value based on a single relatively minor upgrade, an apron sink is an iffy choice for boosting resale value. You need to consider the risk of turning off potential buyers. Depth: The standard sink is 7 to 8 inches deep. 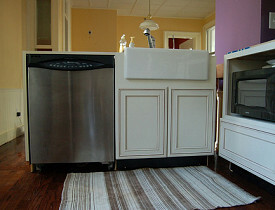 However, the front edge of an apron sink is lower than most sinks because there is no countertop. This could lead to more splashing, and may be less convenient for some users. Deeper apron sink basins are available, but they can be uncomfortable for tall users.